Most users have actually experienced the photos from iPhone camera saving in HEIC format, if they update their iPhone 7 (Plus) to iOS 11 or update to the newest iPhone X/8 (Plus). Even though the sizes of these new formats are quite smaller and occupy lesser storage than normal taken photos, they are not as compatible as JPG and they don't work everywhere. It is important to note that HEIC is an iOS 11 image format that doesn't work on the android devices, Windows computer, and other related devices. iMyFone HEIC Converter is a software that allows you to easily convert photos from HEIC to JPG iPhone format. 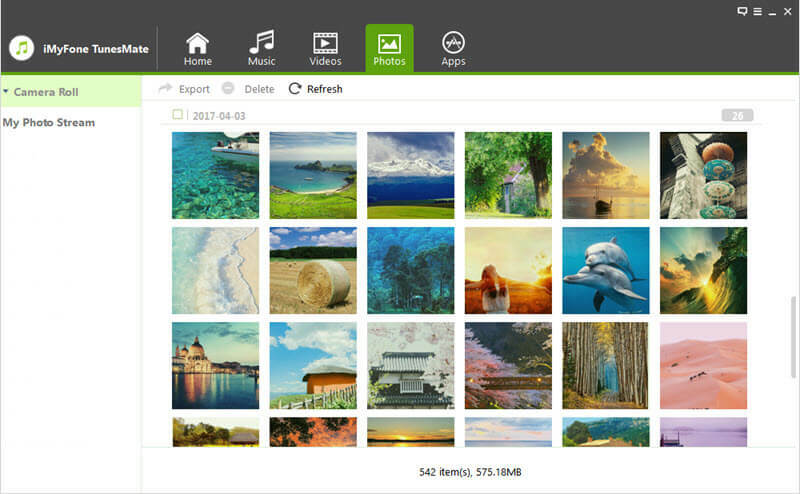 It allows you to convert all the photos in batches or one at a time. 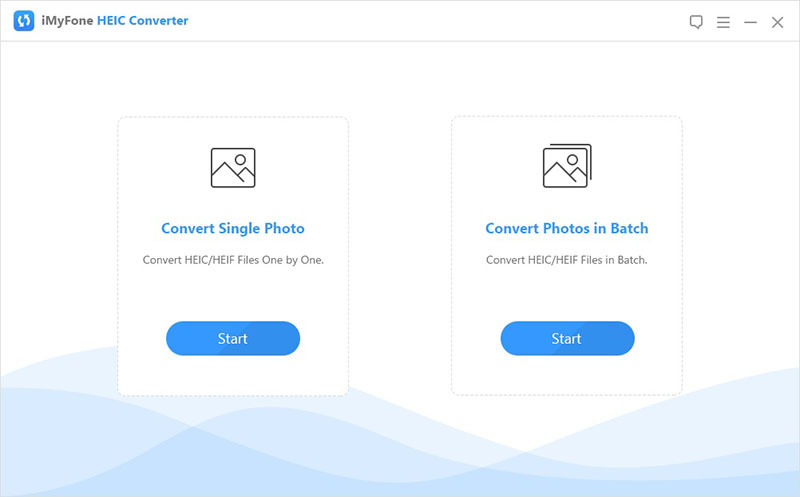 Convert HEIC photos one at a time or in batch. Convert HEIC to JPG in iPhone or computer. Convert HEIC photos without losing image quality, or you can change the quality. Convert HEIC to JPG iPhone locally, instead of online converting, which is much safer for privacy. Convert photos in a fast way, that an image will take less than 1s. Why Should We Choose iMyFone HEIC Converter? It fixes any issues relating to HEIC compatibility and prevents any leakage of photos. It is very convenient to use and allows you to convert to two different formats. It’s safer than using online converter as it won’t cause any privacy leak. It’s easy to use: You only need to move all the images in HEIC format from the saved location to the HEIC converter using the drag and drop process. Step 1: Download iMyFone HEIC converter and install it on your computer. Simply launch the software and select your preferred mode from "Convert Single Photo" and "Convert Photos in Batch". Step 2: From the folder that shows up in the pop-up window, choose the actual photo you want to convert and adjust the photo quality. You can also select your target folder if you wish. Step 3: Tap the Convert button and watch as the software converts your photos from HEIC to JPEG in a few seconds. You need to ensure that your iPhone doesn't use HEIC in the first place. 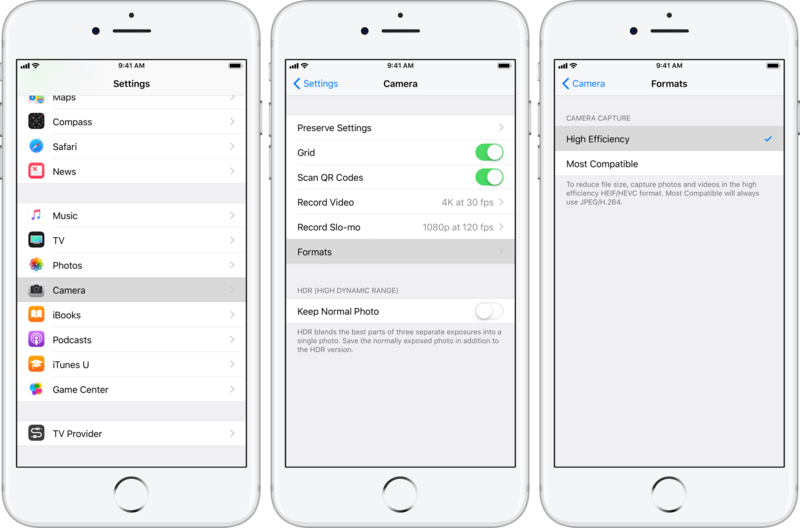 This will allow iPhone to save images in the normal JPEG format only. The photos will be saved as HEIC formats on iPhone, but when you transfer them to PC or Mac, the transferred photos will be JPG formats on your PC/Mac. This process only works for photos that are captured at a later time. It does not work for previously existing photos. iMyFone TunesMate is a PC and Mac software that allows the easy transfer of videos, photos and other related files from your iPhone to your computer. It is a great alternative to iTunes which also allows the transfer of HEIC files. Besides, you can easily use iMyFone TunesMate to view or open your iPhone HEIC photos for free. 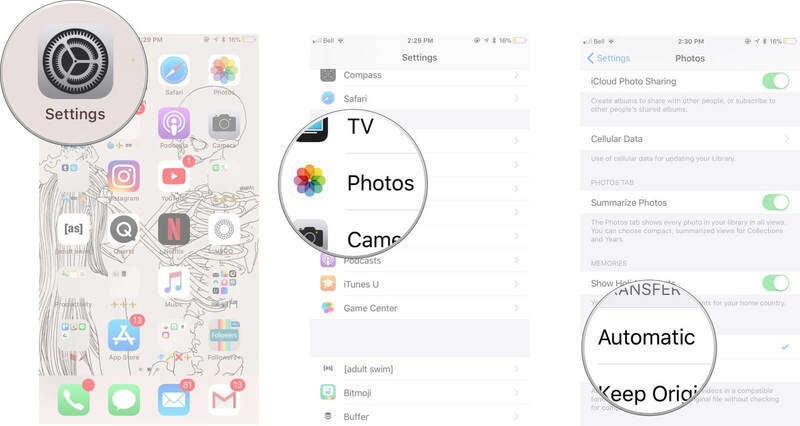 Manage HEIC Photos: View iPhone HEIC images for free; transfer iPhone HEIC files to PC/Mac; delete unwanted HEIC photos in batch. Two-Way Transfer: Freely transfer media files between iPhone and iTunes, between iPhone and computer. Purchases & Non-Purchases: Unlike iTunes that only extract purchased files from iPhone, it supports to extract purchases and non-purchases from iPhone. Enrich/Share iTunes Library: Enlarge iTunes library from, and share iTunes library to unlimited iDevices even in different Apple IDs. Files Supported to Transfer: photos, music, movies, playlists, podcasts, audiobooks, iTunes U, etc. Step 1: Download iMyFone TunesMate on your computer an simply launch the app. Step 2: Connect your iPhone and computer together and ensure that your device is recognized by your computer and tap the Photos option on TunesMate. Step 3: You will be able to view all the photos available on your iPhone especially images with HEIC format. From the left sidebar, you can also choose the album to view the images in it.